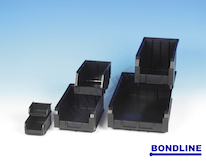 Stackable conductive containers with option of hinged lid. the most ideal method of storing / transporting the most delicate and E.S.D. sensitve products. All items are extremely strong and durable providing exceptional mechanical protection. EL312 Container. 300 x 200 x 120mm. 260 x 160 x 100mm. EL3200 Lid. 300 x 200mm with standard lid catch. BLD3200 Conductive low density foam piece. 255 x 155 x 10mm thick. EL4300 Lid 400 x 300mm with standard lid catch. BLD4300 Conductive low density foam piece. 355 x 255 x 10mm thick. EL8600 Lid 800 x 600mm with standard lid catch. 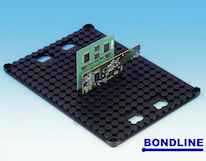 BLD8600 Conductive low density foam piece. 755 x 555 x 10mm thick. Simple yet very efficient method of storage/transportation of Printed Circuit Boards. Frames are fully adjustable and extremely versatile as they can be used in a vertical, horizontal or flat position. They are made up of 2 end walls located on aluminium rails with the option of a central divider for added capability. THE ASSEMBLED RACKS WILL FIT PERFECTLY INTO A STANDARD EURO CONTAINER. A typical large rack is made up of two end walls and a pair of rails. The centre frame is optional. EL41 Conductve end wall. 350 x 190 x 30mm. EL42 Conductive centre(optional). 350 x 190 x 35mm. ELF6 Pair of aluminium rails. 53 x 552mm long. Other standard aluminium rail lengths. (All rails are inter-changeable). ELF1 Pair of aluminium rails. 53 x 152mm long. ELF2 Pair of aluminium rails. 53 x 252mm long. Grid style slot design allows simple yet effective storage of PC boards up to 2mm thick. ELF43 Rack size 355 x 255 x 14mm. A complete range of conductive plastic picking bins which have all the standard designs and features universally accepted with this versatile method of storing / handling. These bins can be fitted to louvred panels or can be stacked. 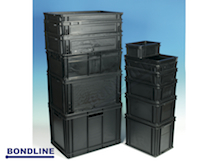 Very strong, versatile and attractive round fronted bins to allow easy picking. TB2 169 x 95 x 75mm. TB3 230 x 140 x 130mm. TB4 350 x 200 x 145mm. These half open sloping fronted bins allow easy component picking. An added feature to the FAMI range is that the two smallest bins actually lock in to each other giving a solid stacking feature. 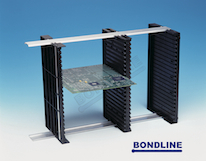 Robust moulded PCB racks offer a very convenient method of storage in assembly area. PCBS 210 x 275 x 95mm. 25 slots. 3mm wide. PCBL 350 x 270 x 130mm. 25 slots. 2.2mm wide. PCBHD 406 x 275 x 150mm. 48 slots. 3mm wide. 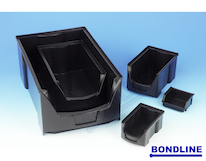 A full range of conductive polypropylene boxes with lids. Can be supplied empty or with any combination of high / low density conductive foam. Please contact us for me information. SB1 40 x 40 x 13mm deep. SB2 74 x 52 x 18mm deep. SB3 110 x 83 x 17mm deep. SB5 228 x 128 x 30mm deep. SB6 90 x 65 x 17mm deep. Standard carousel has 40 individual trays and enables easy storage and easy handling of components in the assembly area. These useful cabinets can be wall hung or stood on a worktop to give simple and easy component storage. Identification labels are included with each cabinet. Trays can be vacuum formed in almost any configuration to give versatile method of storage. TY1 Size. 325 x 175 x 25mm deep. Single cell with 1 x 10mm stud. TY12 Size. 375 x 350 x 25mm deep. 12 cells.103 x 79 x 24mm. TY25 Size. 305 x 250 x 22mm deep. 25 cells.50 x 38 x 16mm. TY50 Size. 305 x 250 x 25mm deep. 50 cells.42 x 26 x 13mm.